By 1890, the Anglo interests had virtually taken over all that remained of New Spain. 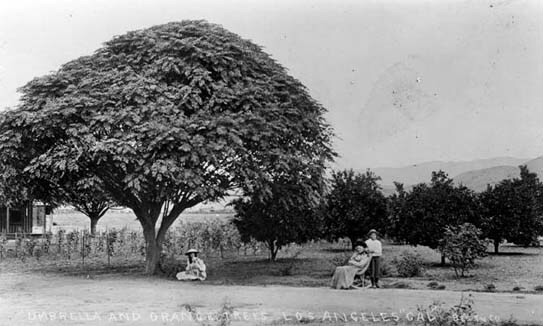 Post Civil War immigration from the East had established new agricultural communities throughout Los Angeles and the San Fernando Valley. The area adjacent to Laurel Canyon was almost exclusively farm and orchard land. 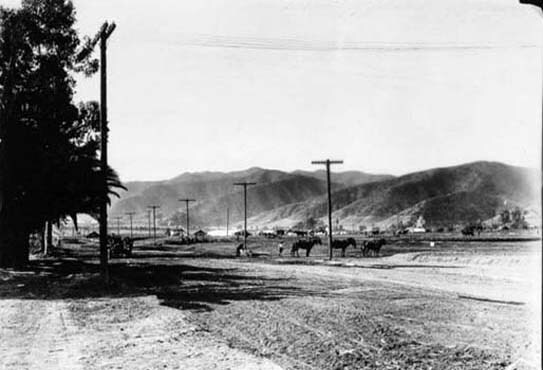 The photo above shows Sunset Boulevard near Fairfax – just a dirt track prior to 1900. The photo above shows a portion of the Harper ranch at the mouth of Laurel Canyon. Locals would drive their horse-drawn wagons into the cooler canyon on summer Sundays for a picnic. It was rumored that bandits and thieves hid out in the many caves that can still be seen at the intersection of Lookout Mountain and Laurel Canyon Boulevard. Sheep ranchers also used the hillsides and shaded valleys for grazing. 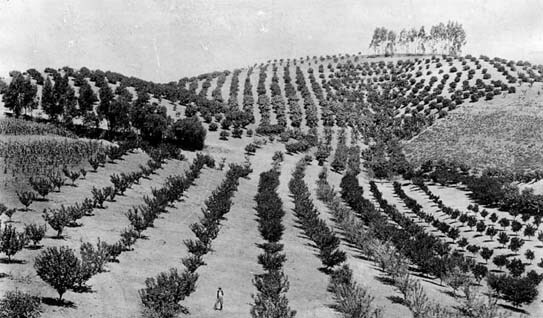 Orange groves were a ubiquitous element of the Los Angeles landscape in the late 19th Century. Virtually all of them would be gone by 1930. The 'arcadia' that had lured easterners to the Southland would soon be - well - history. Of course, the era leading up to the late 1800's was anything but peaceful. 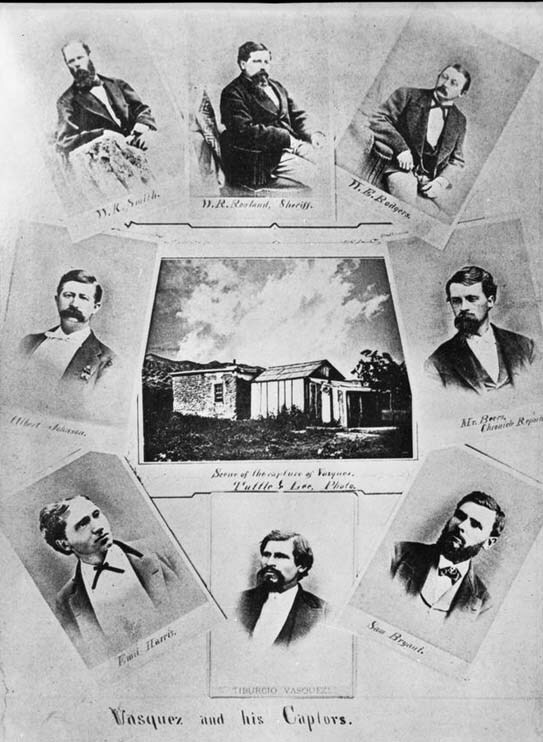 The Anglo takeover of Mexican California was noted for its injustice, violence and racism. The weak Mexican government was in no position to defend Mexicans in California, so many Hispanic residents took actions on their own. One was the famously well educated and handsome bandit, Tiburcio Vasquez. The young Vasquez led a rein of terror against Anglo commercial interests throughout California as a way to avenge the theft of his parent's and other Mexican property. He was finally caught by LA's white sheriff at a farm house at the corner of Santa Monica Boulevard and King's Road. He was hanged in 1874. Thus ended the second cycle of racial injustice in California. The first being the Spanish subjugation of Native Americans, the third being the actions of Whites against Blacks throughout much of the early 20th Century, and the fourth being the confinement of Japanese to concentration camps during World War II. From The Los Angeles Public Library Photo Collection. Continue for more historical images of Laurel Canyon in the early 1900's.